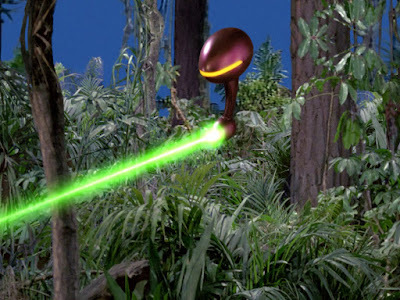 In “The Tower of Tagot,” the evil alien named Tagot (Paul Wexler) utilizes his “future machine” to determine that he will, within 24 hours, clash with alien visitors: Barney (Chuck McCann) and Junior (Bob Denver). Tagot then sends an alien ship that resembles a giant spider to prevent this encounter from occurring. Meanwhile, in space, Junior is reading a comic book that seems to predict their next adventure, while Barney pilots the lunar lander between planets. The space nuts soon run afoul of the spider space ship and crash on a planet. There, they learn from the alien Zarlam (Robert Quarry) that the beautiful Princess Pulma (Barbara Rhoades) has been captured in the tower of Tagot and must be freed so she can reclaim her throne. Junior uses a space sword (which can erase any flesh or object it strikes…) to battle Tagot, and Pulma soon falls in love with him. 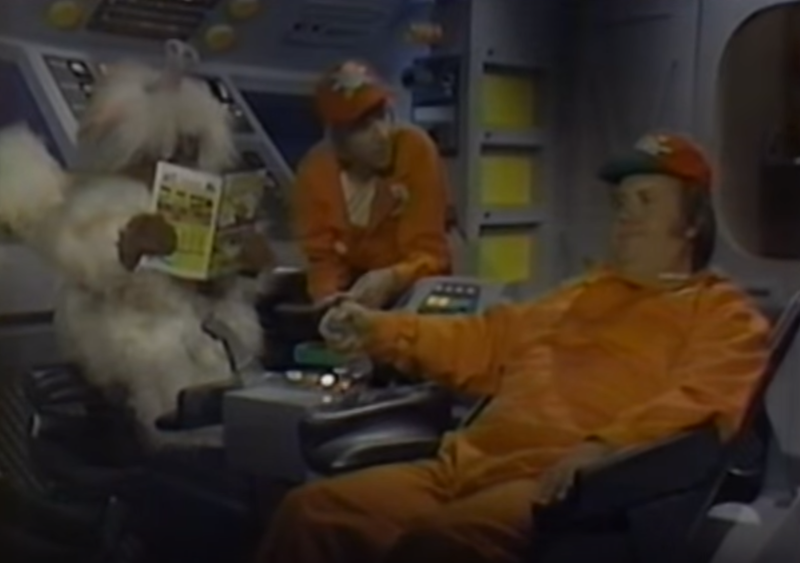 “The Tower of Tagot” is the weirdest, most stream-of-consciousness episode -- so far -- of Sid and Marty Krofft’s live-action series Far Out Space Nuts (1975). Do I write that sentence every Saturday? It certainly seems like it. Basically, a villain, Tagot, can see the future using an alien machine. But this miraculous device is countered by Junior’s comic-book, which can also see the future of the space nuts. So good guys and bad guys are evenly matched, I suppose. 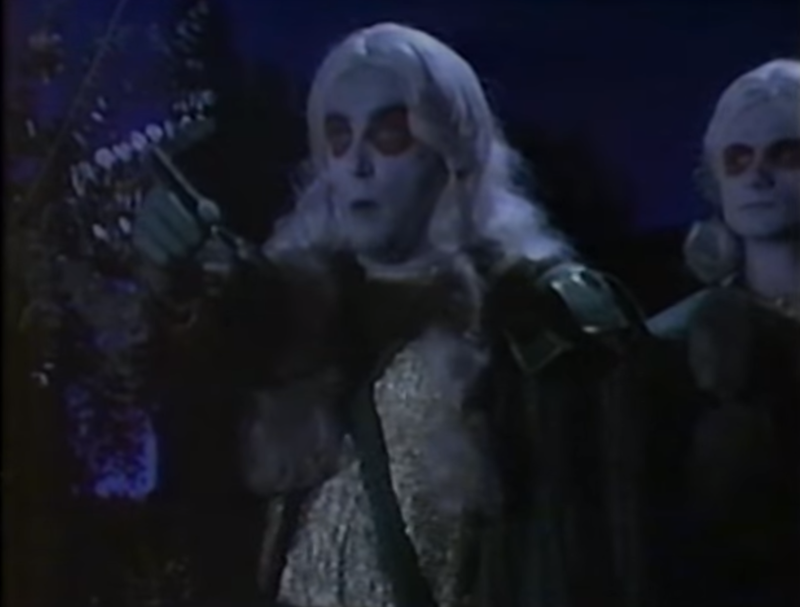 The big news here is the guest appearance by Robert Quarry -- Count Yorga himself -- as an alien who resembles Brain Guy from Mystery Science Theater 3000 (1988-1999). The difference here is that Junior falls in love with Pulma, and wants to remain with her on the planet. This is how he feels, until the future machine shows him how hideous the queen looks when she isn’t wearing make-up on her face. 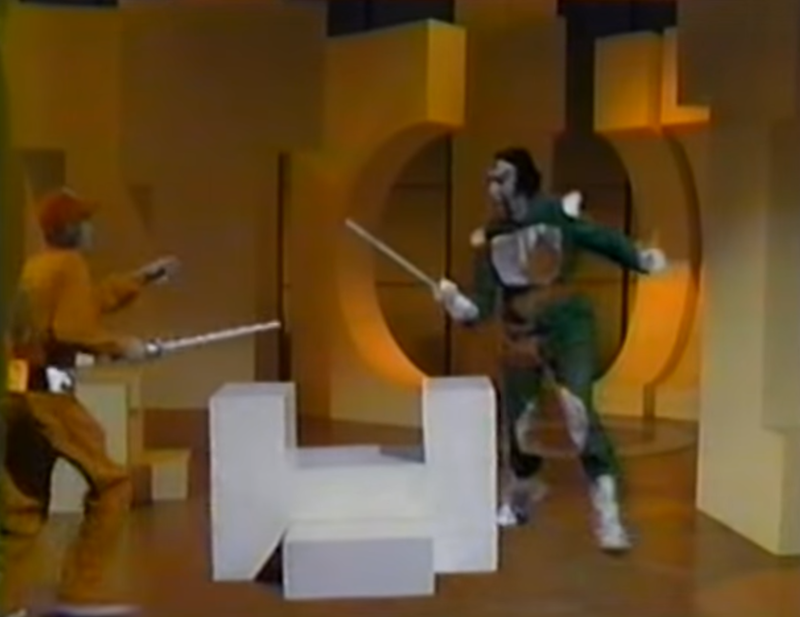 The highlight of the episode is the sprawling, ridiculous pre-Star Wars (1977) light-saber duel between Junior and Tagot. Ambitious use is made of chroma-key effects as Barney and Junior dangle from a tower during the final battle. The battle ends when Junior accidentally hits a switch that collapses the tower. Another one of my favorite episodes. Like Lantana, I had a thing for the Queen (well, at least till she took off her space make up). Loved the villain Tagot, the great sword duel and of course the collapse of the tower. Great memories.